Internet connections have moved beyond computer desktops to interface with parking meters, thermostats, appliances, lighting products and car monitoring devices that track mileage so you pay insurance only for the amount of driving you do. These “Internet Of Things” (IOT) have become the next “tipping point” in the world of work where jobs that are eliminated today will be replaced by new jobs related to the new world of almost instant global connectivity. Today, high speed wireless platforms, standardized software components and inexpensive sensors have made the connection of virtually everything from gas pumps to cars a reality. Even how we work and use metrics to evaluate our performance can be monitored making the delivery of VALUE a measurable variable to ensure our employability. Essentially, the planet is getting a central nervous system and developing intelligence. The physical world is becoming a global information system where sensors and actuators embedded in physical objects are linking almost everything through wireless networks. · Pill-shaped micro-cameras can travel through the human digestive tract and send back images to pinpoint sources of illness. · Precision farming equipment with wireless links to data collected from remote satellites and ground sensors can take into account crop conditions and adjust the way each individual part of a field is farmed. · Billboards in Japan scan people passing by and assess how they fit consumer profiles and instantly change displayed messages based on those assessments. · Peeko Pajamas offers a new kind of infant monitor that provides parents with real-time information about their baby’s breathing, skin temperature, body position and activity level on their smartphones. · GlowCaps fit prescription bottles via a wireless chip providing services that help people follow their prescription regimen with reminders refill notices and doctor updates. IOT is already shaking up the job market in terms of future jobs and what workers will need to know to integrate this technology within the workplace. Recognize that the technology is just an enabler. The real changes involve business model transformations across industries adjusting to the new realities of what instant global connectivity can offer. 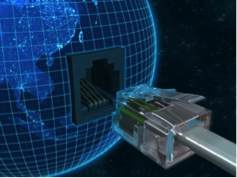 By 2015, it’s estimated that 75% of the world’s population will have access to the Internet. Consider Netflix. It destroyed Blockbuster by using the Internet to vastly improve the logistics of exchanging DVDs and removing those annoying late fees (Blockbuster earned $134 million annually from those fees). Then Netflix converted DVD’s to bytes and delivered their movies over broadband changing an entire industry in just a few years. IOT has attracted the attention of tech giants including Cisco, Intel and General Electric, each of which have internal business units dedicated to building the infrastructure for a IOT products and services. They are already looking for employees who can engineer new products and process the data they collect. In the near future we will have a critical need for people who are a combination of data scientists and operation managers – people who have both an understanding of how to use data and analytics along with an understanding of their specialized business. People need to be able to work with unstructured data at very large scales with the capability to use it to create revenue, reduce costs or solve a business problem. As the world population exceeds 7 billion and number of connected devices reaches 13 billion, the Internet of Things will be a much bigger revolution than the Internet and mobile phones combined. Just about every industry is exploring how IOT can impact their bottom line. As data is extracted and analyzed from connected objects, ranging from office equipment to machinery, to delivery trucks, to how workers move about in a workplace, your employability will be tied to effectively using data and the tools of the IOT to create value.